Apple could buy everyone except Samsung and still have $25b left. Course they won't. They'll turn to a new market. The last time I did this comparison (Apple could buy the mobile phone industry | asymco) was in June after the end of the second quarter. The following chart is an updated look. Sony Ericsson was valued through its acquisition by Sony. We did not have a way to value the enterprise before as it was not traded independently. Last June I estimated a 14x multiple on its trailing twelve months’ profits and got $3.0 billion. Since then half the company changed hands for about €1.05 thus yielding a total company value of $2.8 billion. The enterprise value should be therefore slightly lower but I’ll stick with the current transaction value as the EV. Motorola Mobility has entered into an agreement to be acquired by Google for $12.5 billion by Google. The company’s enterprise value jumped as a result to about $8.6 billion. RIM’s share price collapsed and it’s now also trading at an EV of about 7.3 billion (Yahoo finance). Nokia’s price has also dropped and it now has an EV of about $13 billion (Yahoo finance). HTC recently dropped significantly in price and is now worth about $15 billion EV. (Note that pricing of its equities is subject to suspended trading due to drop limits). LG’s phone business is still losing money and it’s still difficult to value. In November it was revealed that the company was seeking to raise $890 million in capital to fund new initiatives including smartphones. The share price fell by 14%. In June I suggested a nominal value for the phone business of $10 billion. I think that’s very generous and with recent events I would place that value at $9 billion today. Samsung’s fortunes have increased. In June I applied a 14x multiple to their trailing 12 months’ operating earnings. Given overall discounting of the sector I applied a multiple of 13 today. That yields a business value of $78 billion. 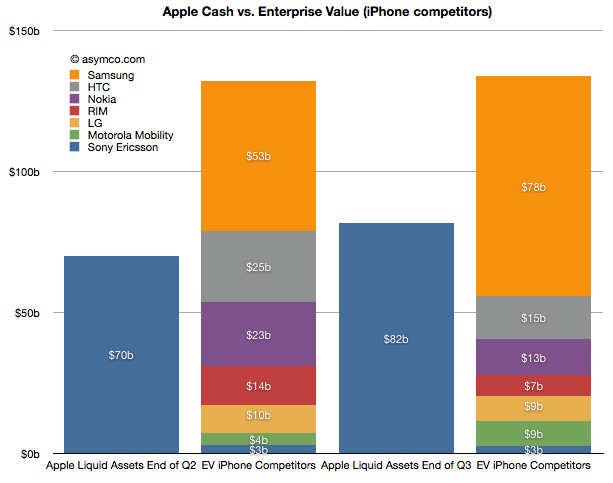 Interestingly, that is larger than the value of all other competitors apart from Apple. That also makes it six times more valuable than Nokia. Apple’s cash and cash equivalents and investments grew by about $12 billion and were worth about $82 billion as of October.